Turn it Up! by Summer Sahar focuses on the technique and strength necessary to execute tight, controlled, and quick turns. Turn it Up! by Summer Sahar focuses on the technique and strength necessary to execute tight, controlled, and quick turns. Summer Sahar draws on her training in jazz dance to help you develop the strength and alignment needed to breathe life into your turns. 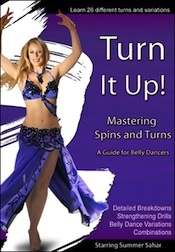 After sections on turning technique and strengthening exercises, Summer introduces an array of specific turns, including a few ballet turns that can be modified for belly dance. Duration: 124 mins.